Synonyms: Pyrola umbellata L.; Chimaphila corymbosa Pursh. Other common names: Prince's pine, pyrola, rheumatism weed, bitter wintergreen, ground holly, king's cure, love-in-winter, noble pine, pine tulip. 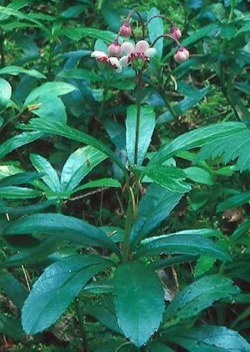 Habitat and range: Pipsissewa is a native of this country, growing in dry, shady woods, especially in pine forests, and its range extends from Nova Scotia to British Columbia, south to Georgia, Mexico, and California. It also occurs in Europe and Asia. Description: This small perennial herb, a foot or less in height, has a long, running, partly underground stem. It belongs to the heath family (Ericaceae) and has shining evergreen leaves of a somewhat leathery texture placed in a circle around the stem, usually near the top or scattered along it. They are dark green, broader at the top, with a sharp or blunt apex, narrowing toward the base and with margins sharply toothed; they are from about 1 to 2 inches long and about three-eighths to a little more than half an inch wide at the broadest part. From about June to August the pipsissewa may be found in flower, its pretty waxy-white or pinkish fragrant flowers, consisting of five rounded, concave petals, each one with a dark-pink spot at the base, nodding in clusters from the top of the erect stem. The brown capsules contain numerous very small seeds. Collection, prices, and uses: Although the United States Pharmacopoeia directs that the leaves be used, the entire plant is frequently employed, as all parts of it are active. Pipsissewa leaves have no odor, but a bitter, astringent taste. They bring about 4 cents a pound. Pipsissewa has slightly tonic, astringent, and diuretic properties and is sometimes employed in rheumatic and kidney affections. Externally it has been applied to ulcers. Another species: The leaves of the spotted wintergreen (Chimaphila maculata Pursh) were official in the Pharmacopoeia of the United States from 1830 to 1840. These may be distinguished from the leaves of C. umbellata (pipsissewa) by their olive-green color marked with white along the midrib and veins. They are lance shaped in outline and are broadest at the base instead of at the top as in C. umbellata.